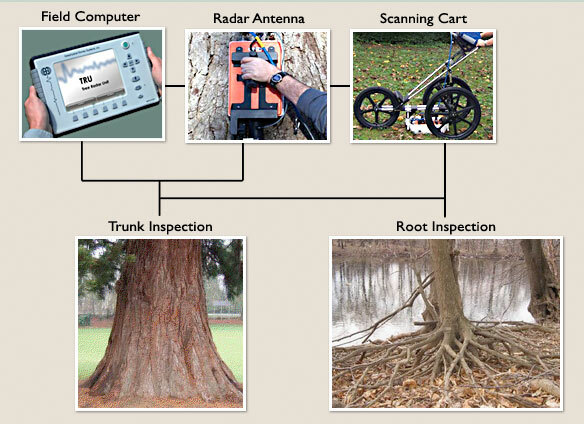 The patented TRU (Tree Radar Unit) System is a field instrument that uses ground-penetrating radar (GPR) technology in a new and novel way to non-invasively determine both the internal structure of a tree and its structural root mass. These are two separate measurements of the health and structural integrity of a tree. The advanced-technology and patented TRU system consists of a portable, battery-powered data acquisition unit and an off-line data analysis software module. * Please allow pop-ups from this site on your browser. Set up requires 5 minutes and a complete 360-degree peripheral scan around the trunk (at a given elevation) can be done in 1 minute. The rechargeable batteries provide at least six hours of continuous use. No trunk preparation is required. 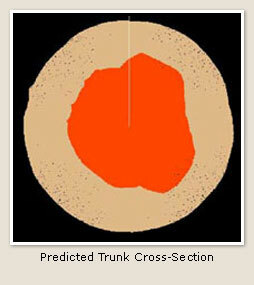 The trunk is typically scanned at multiple elevations to accurately map a decay column's advance along the trunk. 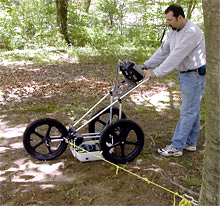 Subsurface root scans can be done in 30 to 60 minutes to map the structural root density, location and depth. The entire TRU system can be transported in either two carrying cases or in a back pack and small carrying case. 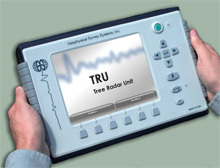 The key to TRU's capabilities is its proprietary software module, TreeWin. This post-processing data analysis package reads the digitized radar waveforms from the field computer and processes the data to create cross-sectional images of the trunk's internal condition for each elevation scanned as well as 2D and 3D plots of the root density and layout. 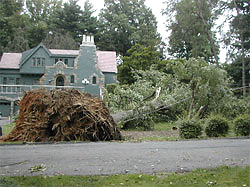 These graphical and quantitative results are then used by certified arborists, in conjunction with other standard diagnostic techniques, to assess a tree's health and structural integrity. 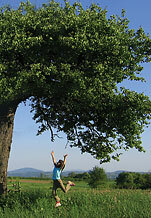 TRU produces very detailed high-resolution images in a completely non-invasive way that does no harm to the tree. 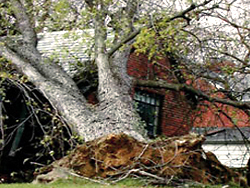 The TreeWin software module produces high-resolution, cross-sectional images of the trunk showing the shape and extent of any decay and/or cracks present at each elevation scanned. The example shown on the right is the software-generated cross-sectional representation of the 2D data above. The brown area is the remaining solid wood. 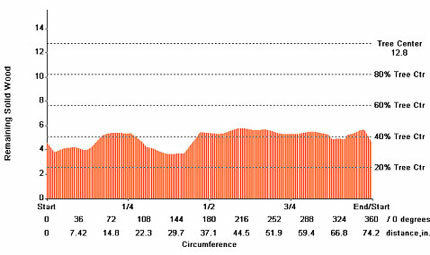 The orange area outlines the internal decay. A thickness plot is produced showing the thickness of the remaining solid wood around the entire circumference. A top-down plot of the subsurface structural root density and layout shows the shape and extent of the structural root biomass density at varying distances from the trunk and drip line. 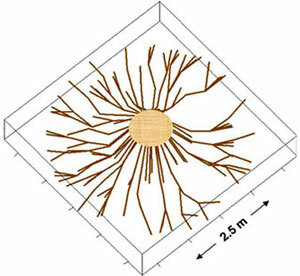 The image below represents a 2D planar view of the root location and depth along a 12 ft (3.7 m) scan line. This is the same view as would be seen if a backhoe excavated a ditch 12 ft long and 15 in (38 cm) deep. This is why a TRU roots line scan is called a "virtual trench". 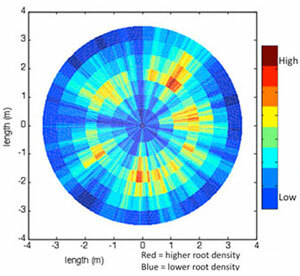 The image below shows a 3D top-down view of the root layout and density. 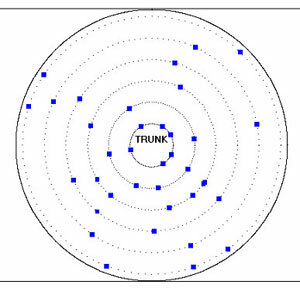 The first circle is at a 4 ft (1.2 m) radius from the trunk. Every other circle is at a radial increment of 2 ft (0.6 m).